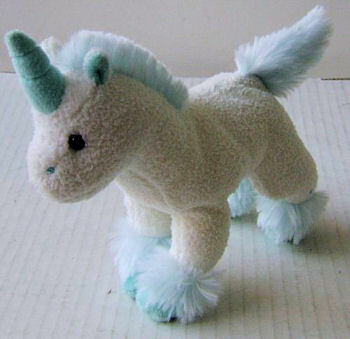 I’m looking for a little light blue unicorn with sea foam horn and hooves. She’s moderately firm, with a cotton-like body and a blue fluffy mane, tail, and around her feet. She stands up on her own. At the moment I’m a freshman in high school. I recently remembered a small fond something from when I was a little girl with my best friend. We both had two favorite stuffed animals who we insisted on bringing everywhere. Mine was a small orange tabby cat, but hers was this small unicorn. She was an extremely important toy, and now I’m trying to find it for my friend. We haven’t spoken in a year or so, but she’s still my best friend, and I want her to know. I found an out of date Amazon site that supposedly sells her, but it won’t let me buy her, so I need a different site to buy her from. Please help. I’m not positive, but I wonder if your friend’s unicorn might have been made by Goffa.